The true test of courage is the way men respond when confronted with terrifying danger. 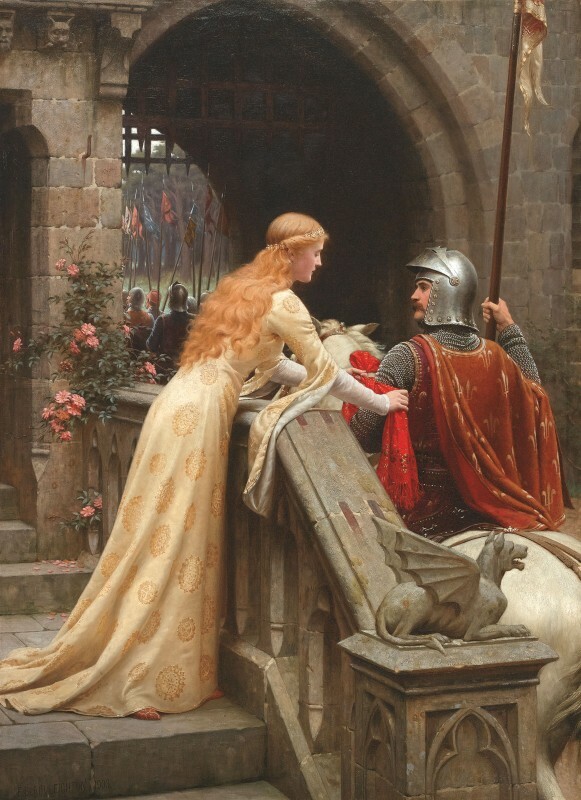 Such a moment unfolded in 1263. The seconds that followed would test the mettle of each man in a hunting party accompanying Scotland's King Alexander III. When a ferocious stag charged, every man but one cowered. Colin of Kintail, Chief of the Clan MacKenzie, launched his spear into the stag's forehead. As he did, he exclaimed in Gaelic, “Cuidich n Righ,” meaning “Save the King!” This act of bravery proved the defining moment in the life of Colin of Kintail, the Clan MacKenzie, and The Dalmore. Fortune favors the brave, and Colin of Kintail would see his bravery rewarded with a king's ransom in fortune. The king bestowed upon him the lands of Eilean Donan and the right to bear a 12-pointed Royal Stag as a crest. The Dalmore's rich legacy is exemplified by the Constellation Collection seen at the very top of this page. 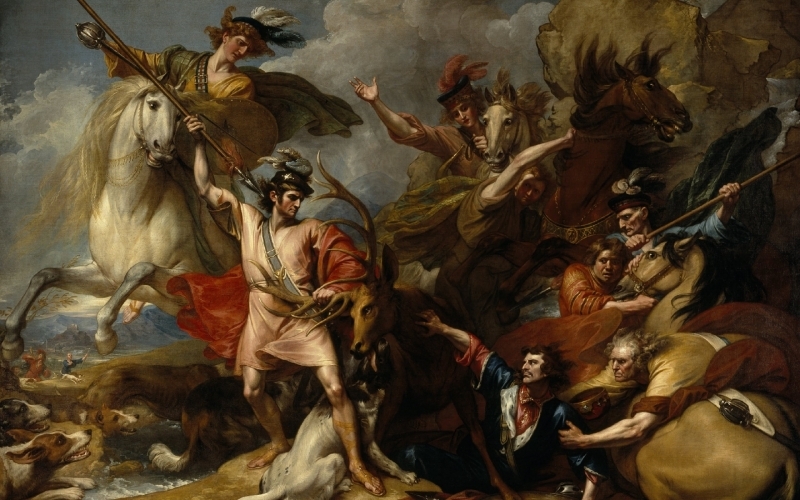 Also, just above is a painting by Benjamin West, the legend on canvas, Alexander III of Scotland Rescued from the Fury of a Stag. 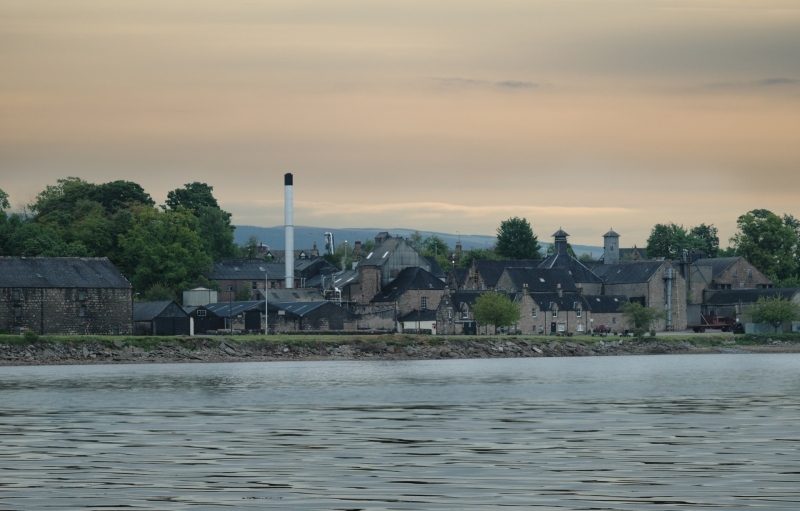 In 1839, Alexander Matheson sought the ideal site for a distillery he had long dreamed of founding. He discovered that setting far from the creature comforts of the Speyside Valley favored by more conventional distillers, and staked his claim to the isolated, windswept banks of the Cromarty Firth. In this forbidding milieu, he blazed his distinctive path, establishing warehouses and transportation links as he created the unrivaled character and taste of The Dalmore. Having perfected that splendid whiskey over nearly three decades, he passed his distillery on to its new owners, Andrew and Charles Mackenzie. The MacKenzies possessed more than the fierce family pride bequeathed them by their ancestor Colin of Kintail, Chief of the Clan MacKenzie. They also carried with them the legendary 12-pointed Royal Stag emblem. 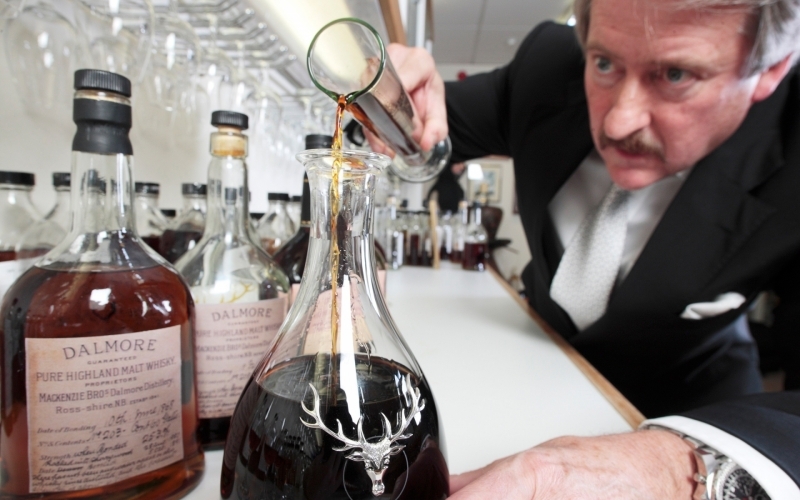 Ever since that venerated symbol has graced every single bottle of The Dalmore. 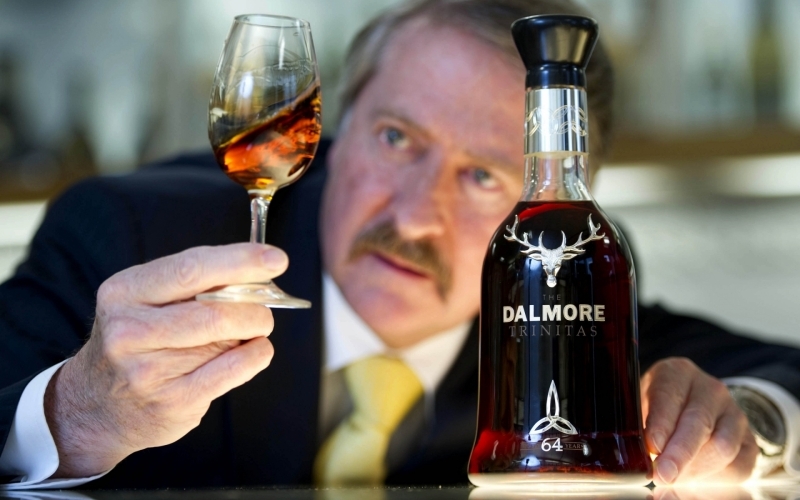 Richard Paterson, The Dalmore's master distiller, celebrated 50 years of unparalleled Scotch whiskey craftsmanship in September 2016. 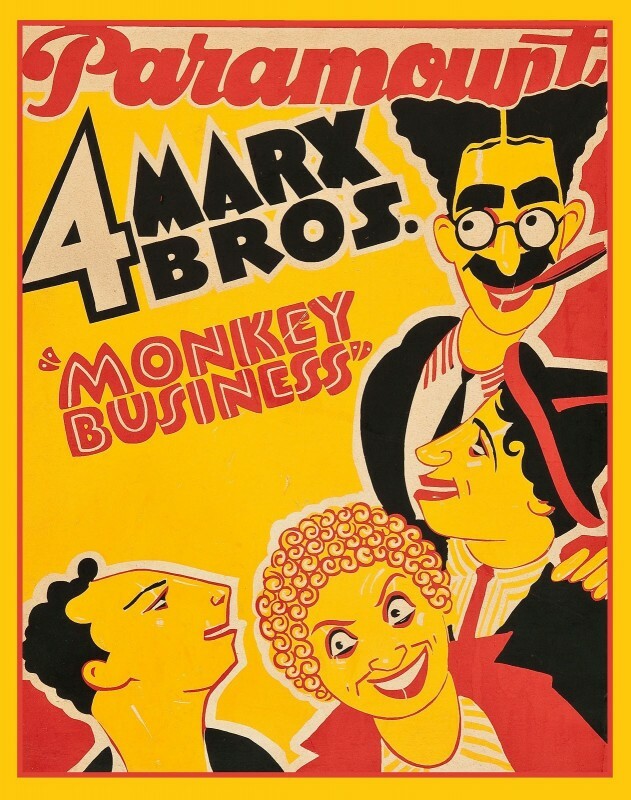 His half-century in the industry not only earned him his moniker “The Nose,” but also the reverence of all who've come to know this lionized expert in fine Scotch whiskey making. Paterson mastered his craft under the tutelage of his grandfather and father, the latter teaching him how to “nose” whiskey while still a grade school youngster. Paterson rose to the exalted title of a master blender at the tender age of 26, and after a celebrated career in whiskey making saw himself recognized with the Icons of Whiskey Lifetime Achievement prize at 2013's World Whiskey Awards. The Dalmore-Paterson Collection and the recently unveiled Dalmore Quintessence are fitting tributes to Paterson's unwavering commitment to excellence as master distiller at The Dalmore. 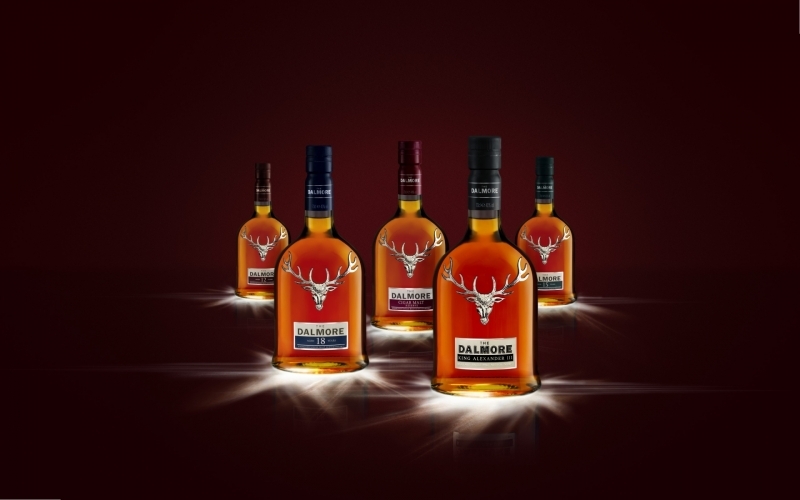 When it came time to blend his ultimate creation, Dalmore King Alexander III Select, master distiller Richard Paterson summoned every ounce of his whisky-making prowess. He journeyed the length and breadth of the globe, hand-selecting an incomparable array of differently-aged malts. Each has matured in one of a variety of casks meticulously selected for this extraordinary genesis. Aromatic oloroso butts and Madeira drums deliver a whisper of citrus orange, spice and nuts. Fragrant bourbon barrels from old Kentucky distilleries impart ambrosial notes of vanilla. The woods of rich port and Marsala imbue hints of wild berries and ripe plums, augmented with other lush fruits. This extraordinary blending achievement yields a Scotch whiskey so superlative it very simply has no counterpart on earth. It is the world's lone single malt to incorporate no fewer than a half-dozen distinctive cask finishes. 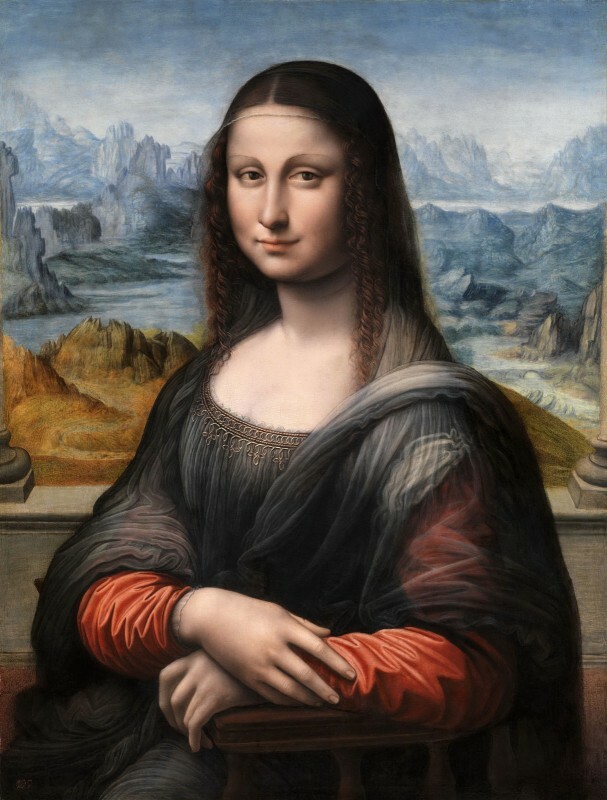 In this era of squandered hyperbole, the term “aged to perfection” is employed all too often and entirely too casually. But that description is quite fitting for The Dalmore’s Scotch Whisky known as Dalmore Selene Blend. This impeccable blend is kept captive in the dark of The Dalmore Distillery for nearly six decades before it ever sees the inside of a decanter. The resultant liquid asset perfectly matches its heavenly name. You see, Selene was the Titan goddess of the moon, the glittering personification of everything flavorful, magnificent and ethereal. 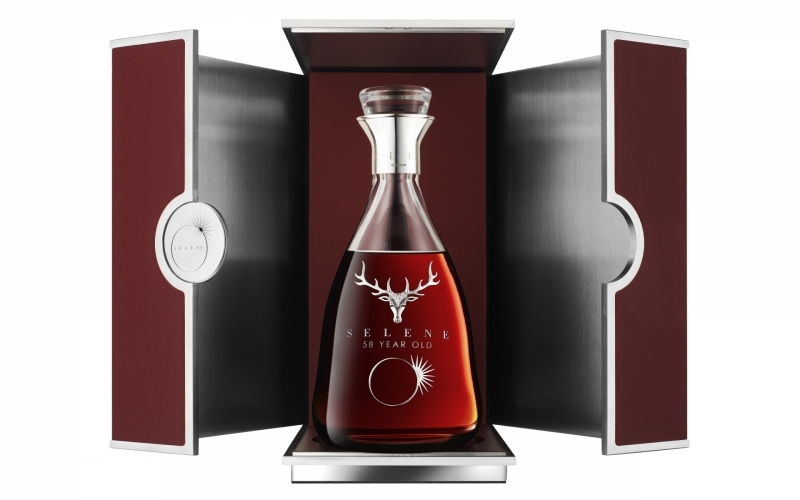 It is rumored there remain just 30 bottles of Dalmore Selene 1951, making this one of the ten most expensive Scotch Whisky in the world. The beatific beverage is packaged in a steel box robed in the finest leather. But the most telling indicator of its prestige is the elegant logo emblazoned on its case: The 12-point Royal Stag Crest and the name, the legend, The Dalmore.